If this is your first visit to my blog, come along while I take you on a little taste of Italy (for my few faithful followers, come along ~ perhaps you’ll be inspired)! Those that know me have heard me say that I truly learned to live in Italy. We were among the fortunate, having been stationed at Aviano Air Base, in the Friuli Venezia Giulia Region of Italy from 2000 ~ 2004. From the moment our plane touched down, we were embraced by a country known for its passion of many things; art, love, wine, language and of course, food. Whether setting out grissini, a small plate of prosciutto from Parma and Pecorino Romano cheese, or a full menu of antipasti, pasta, meat & roasted vegetables; you were going to be richer for the experience. At that moment, the moment of taking in of food, your spirit was also being fed by a deeply time-honored commitment to loyalty ~ a friendship was being born or stregthened. Pull out your tablecloth and linen napkins (a great investment that turns a simple meal into one to be remembered), for even a bologna & cheese sandwich between friends has the potential to become a memory tomorrow! Separate the eggs in 2 mixing bowls; beat the egg yolks until light and airy, add sugar and mascarpone, mix until combined; beat egg whites with 1 T sugar until stiff peaks hold; gently fold into mascarpone-yolk mixture. Using a glass or pretty ceramic pan (8×10 or 8×12) start assembling your tiramisu: dip lady fingers in coffee, lay out in a single layer; spread 1/3 of mascarpone mixture over top, sprinkle with baking cocoa, repeat at least twice more. 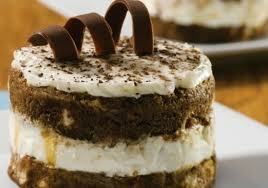 For final layer, shave chocolate over layer of mascarpone. Chill at least one hour, and up to 8 hours. Cut into squares ~ enjoy! Note: To spruce this dessert up (not that it needs it ~ it IS tiramisu!) you can create (or buy) chocolate cups and make individual servings. This is also very pretty as a trifle dessert ~ layer gently-soaked lady fingers around the rim of bowl then assemble as above. I like to serve on a white plate, drizzle with a softened ganache with a few raspberries or strawberries on the side. One of the best things about a simple Italian meal ~ Vin Santo, biscotti, espresso and the last notes of love and laughter among friends and family. Come on… be Italian tonight! This recipe was lovingly passed down from Tony’s cousin Roberta DiPiante from Castello di Aviano, Italy ~ Grazie Roberta!